HK G3 plastic SEF navy lower complete. 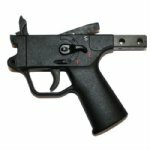 Condition is new, factory fresh unissued plastic lower and selector, like new trigger group taken off new demilled G3 rifles. This was the last lower issued for the German army G3 battle rifle. Navy style straight grip is great for right and left handed shooters. This full auto lower is great for NFA weapons, semi auto conversions or spare parts. All NFA rules apply.